Blue painted metal tin marked 'ANTI-BURN JELLY'. Also has user instructions and Air Ministry markings. Contains a part used one ounce tube of Gentian Violet anti-burn jelly. 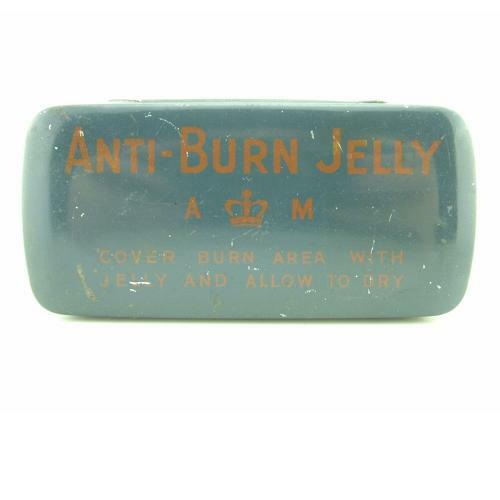 Most anti-burn jelly tins are cylindrical but these unusual rectangular tins were issued inside some of the larger First Aid Kits. Seldom found loose. The tin has minor paint loss and small dents. Jelly tube part used/worn. Great if you need to complete your kit. Stock code M15913.